If you are using Google to search for news, and things then you might want to know the difference between the featured results Google shows to its users from time to time. 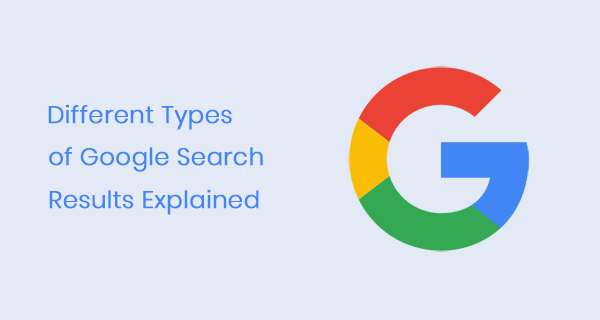 They are now an integral part of search results, especially on Google and Bing. So, in this post, I am going to tell you the difference between featured snippet, rich result, and knowledge graph. Although they look the same they serve a totally different purpose. Check out my recent post on how to save search results in a spreadsheet. What is a Rich Result? You must have seen these search results by now if you use Google. Rich results are mostly shown in various formats such as carousels, images, or other non-textual elements. There are many kinds of rich results. Many are linked to the specific content type being displayed (book, movie, article, and so on). The purpose of a rich snippet or rich result is to provide the most relevant data from a web page to the user within the search results. It will help users to decide whether the page is relevant to their search. Webmasters can use structured markups to enhance their search results. you can also test if your page supports the rich results. 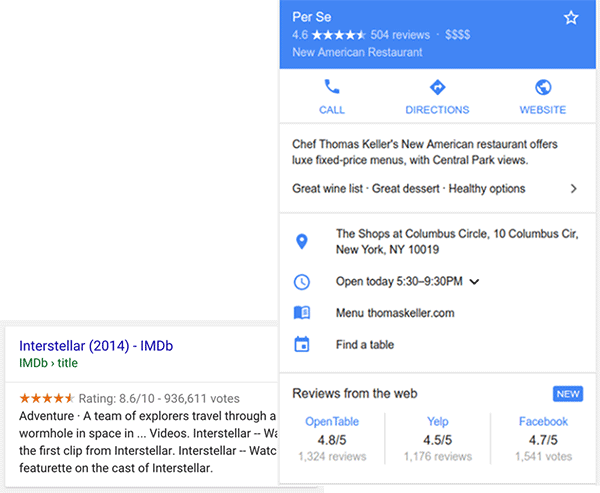 You have to use structured data on your pages in order to be displayed in a rich result. Google further expanded on the Rich snippets in 2016. They improved the presentation of rich results by including “Rich card”. It is similar to the rich snippet but it provides search results in the form of a swipeable carousel format on mobile devices. A featured snippet is a search result on the 1st position hand-picked by Google’s algorithm. It is shown as a prominent block with a page title, content description, and link to the actual page. Google picks up any data from a page which it think would best answer the user-specific question. 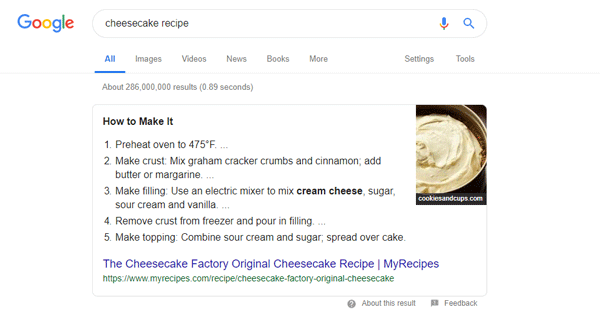 For example, if someone searches for ‘cheesecake recipe’, it is more than likely that Google will show up a featured snippet to the user. You can read further about how to add or remove featured snippet to your webpage. What is the Google Knowledge Graph? 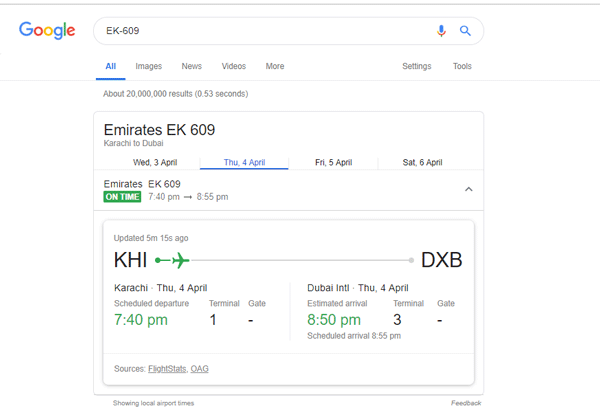 The Google Knowledge Graph gathered information from a variety of sources and used by Google to enhance it’s search results. 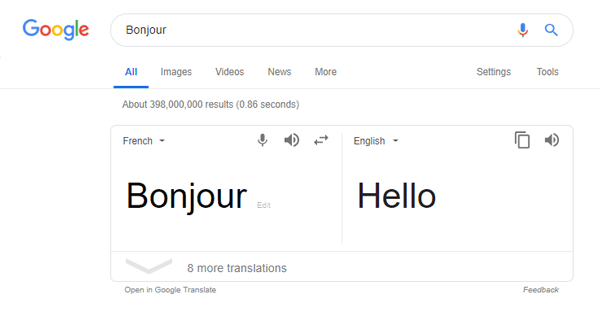 Google usually displays this information in a box to the right of actual search results. Google shows a knowledge graph when you search for specific things such as a company name, influential person, and sometimes books, actors, tv shows, etc..
What is a Onebox Search Result? In simple terms, it looks something like a featured snippet but without any link to the website. These are only shown when you search for things such as weather, time, flight status, translation, and a few such elements. It is not very helpful for webmasters as Google won’t show a link to your website when it shows a Onebox search result. Here are some examples of Onebox search results. You might think that they all look the same but they completely serve different purposes and audience. For example, featured snippet and one box result try to provide a complete answer to user’s questions. However, the knowledge graph and rich result are providing specific information to the user. 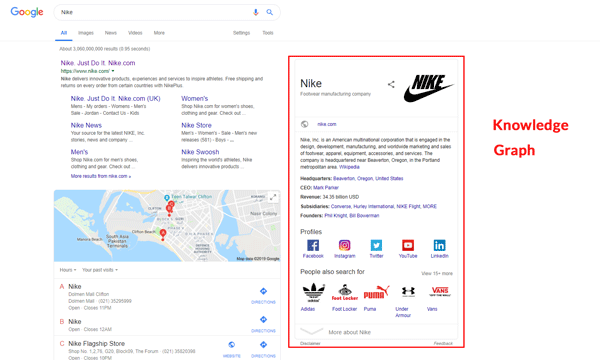 When you search for a company name such as “Nike” or “Adidas”, you will get a knowledge graph about those companies, a description fetched from Wikipedia, social links, website, etc.. Also, webmasters can provide structured data to Google in order to serve knowledge graph and rich results on specific queries. I hope you find this post useful. If you have any questions regarding SEO, content marketing, and digital marketing, please feel free to leave me a message.